Keeping that in mind, any problem you might have would occur in any of the 3 diverter types. 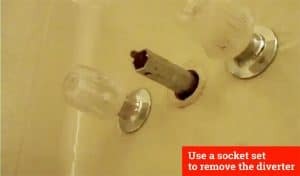 The primary issue you may have will require you to take apart the bathtub faucet and clean, repair, or replace the diverter. This is How To Fix A Shower Diverter: Shower diverters come in 3 different types, tee, two, or three valve. 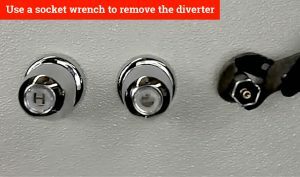 Remove the bathtub faucet to find the diverter. Try cleaning it by soaking in distilled white vinegar for 24 hours and use a q-tip if needed. You may want to replace the corroded nuts or bib washer. Do not worry about not knowing what to do, we will walk you through it! 2. 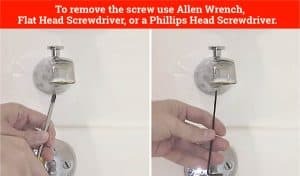 Note that the tool to remove the screw could be an Allen Wrench, Flat Head Screwdriver, or a Phillips Head Screwdriver. 3. Using your hand, twist or pull the faucet as some models are threaded on to the stem. Now you are ready to move on to fixing that shower diverter! 1. Due to this being a tee diverter, the diverter is located within the bathtub faucet, so you will want to start by trying to clean the faucet. 1. 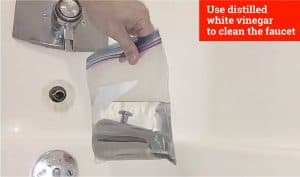 Find a baggy that the faucet fully fits in and fill it with distilled white vinegar, you should let it soak for about 24 hours. 2. 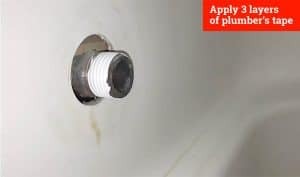 Prior to reinstalling the faucet, if it is threaded, you should apply 3 layers of plumber’s tape which will reinforce the seal. 1. 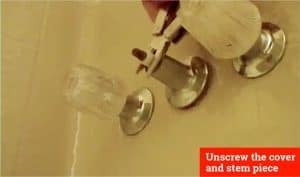 Pro tip – If you are simply replacing the faucet, this is a good idea to do anyways! 1. Start this process by ensuring that the water is coming out of the tub faucet and not the shower head. Although it is not necessary to turn off your water supply, you want to make sure that if water does start coming, you don’t get soaked in the process! 2. 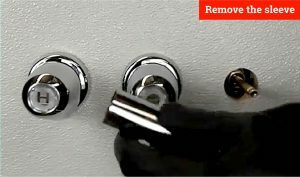 Remove the handle, lever, or knob that is holding the diverter in place. 1. 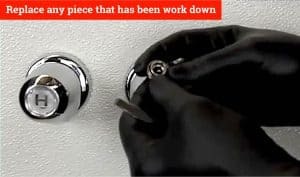 In other words, the piece that you turned to make sure the water was going into the tub. 2. You must find where the screw is located in order to remove the piece. If it is not visible, you can pop the button off using a small flathead screwdriver. 3. 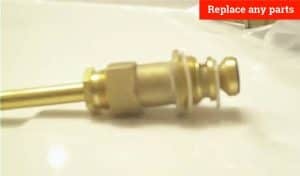 Don’t forget to plug your drain so you don’t lose any parts! 3. Using your hand, or perhaps a wrench if necessary, unscrew the cover and stem piece. 1. 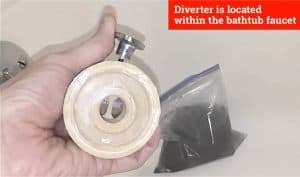 Now you can see the diverter! 4. To remove the diverter, you can use a socket set. 5. You should be able to see if it needs to be cleaned, which is always a good idea anyways, or replace any parts. 1. Cleaning can be done using distilled white vinegar and a q-tip. Simply soak to q-tip in the vinegar and spot clean any mineral buildup that you may see. 2. The parts that may need to be replaced include corroded nuts and/or a bib washer. The bib washer can be worn down or even nonexistent! Once you have cleaned the diverter and replaced any necessary parts, reassemble and enjoy your hard work! 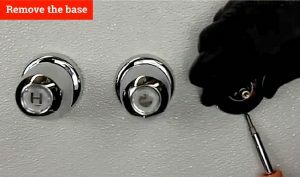 Arguably the more complex shower diverter to fix, you will be focusing on both the hot and cold knobs. Although we will go step by step focusing on one knob, you will need to do the same process for both. 1. For this fix job, you will need to shut off the main water supply to the shower. 2. Start by removing the knob. 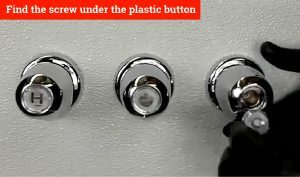 Find the screw, if not visible it is located under the plastic button which will need to be popped off using a small flathead screwdriver. 1. Once the knob has been removed, use your hand or a handle remover to remove the base. If using a handle remover, do so carefully as to not scratch the fixture. 3. You will also want to remove the base and any cement or grit that is located within the hole. 4. 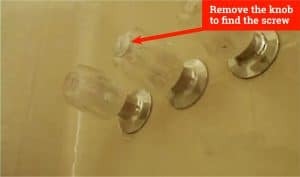 Once the hole is cleaned, you will need to remove the sleeve which may either be screwed on or will need to be removed with a wrench. 1. The wrench may ultimately render the sleeve useless and you may just have to replace it. 5. 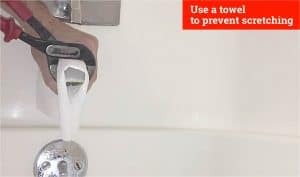 Use a socket wrench to then remove the shower diverter stem, carefully. 1. Make sure the rubber washer is removed with the stem or check the hole. You do not want it in there when you go to put back the stem as it will cause it to not seal correctly. 6. 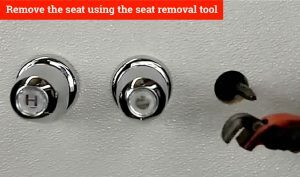 Finally, you will want to remove the seat using the seat removal tool. 1. Place it inside the hole and tap it gently to make sure it is place. Unscrew it to remove the seat. 7. Once all the pieces have been removed, it is time to replace any piece that has been work down or corroded overtime. 8. When putting all the pieces back together, we suggest using a waterproof lubricant on the shower diverter to ensure it fits back nicely. 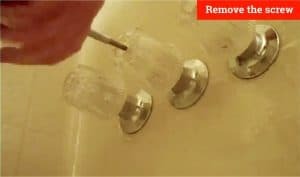 It is never a good thing when your shower tub faucet starts leaking, but it is a good thing when you know what to do to fix it! 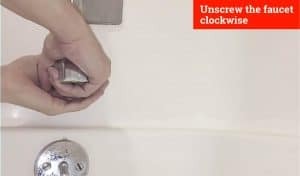 As long as you have the time, tools, and parts for the job you can definitely learn how to fix shower diverter all on your own!